Ireland just seems to be about light and color. Of course the first thing one thinks of is the heavy abundance of green…which is everywhere. But does green always have to be green? As I became more comfortable taking photographs, I started thinking about context, especially in relation to monochrome. I still feel that monochrome is the heart and soul of photography. There is a natural essence to it. Perhaps it is because you need to imagine the colors you see before you in a black and white photo. You obviously know that a variety of colors comprise the shot, but in the best ones, you somehow do not mind. Your see the art and starkness of the scene that color often does not represent as well. You feel the terrain before you in a landscape shot in monochrome. You sense the noise and movement before you in a cityscape shot in monochrome. You feel a connection to the person in a portrait shot in monochrome. As with a lot of my other photographs, I often take them in both mediums to cover myself. Color photography is still wonderful and I probably take more shots in color than monochrome (though the equation is maybe 60/40 now!) Using this method in time I have figured out certain photos I know will only work best in monochrome. Such was the case with this photo taken last summer in Donegal. A random field in a sloping valley, dotted with the occasional house or sheep. It was an overcast morning when I took this, but at one point the sun started peeking through. Up to that point I had been taking color shots of the lush green fields, but once I turned and saw the light beams shining down, I instinctively adjusted the camera for monochrome, and this is the result. Do you see ‘the colors’ in a monochrome shot? Normally Mondays are not so happy for most of us. Today however is a good Monday, since I am off today and tomorrow! But I still have some work to do…such as share with you a new Monochrome Mondays. In the case of one thing leading to another, the other day I changed my profile photo on Facebook to one from Ireland last summer. After selecting it, I scanned through some of the other photos I took, when I came across this one again. For all the natural beauty of Ireland, it is also a place where you are easily reminded of it also being a place where people work hard, and the landscape often shows evidence of it. Piles of turf, or hay bales abound. So do little boats, which seem to be everywhere near the coast. I walked one day down to a tiny little pier in Kilcar, Donegal. By no means was it a beautiful scene, and with the tide in it had that not so attractive smell! But the contrast of this little boat, leaning to one side, while looking towards the town was too appealing for me not to take this photo. Like most people I have always had a strong dislike for Mondays. That dislike is lessened each week when I realize that it is time to present you all with another Monochrome Mondays. This week is no exception! I took this shot last summer in Ireland. 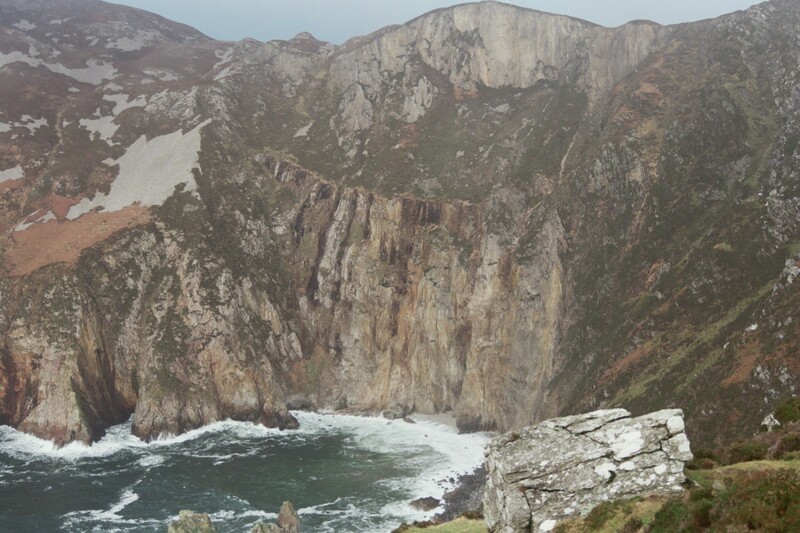 One of my favorite spots in all of Donegal are the dramatic sea cliffs of Slieve League. Its sheer height dominates the landscape for miles around, and once you get up to the cliffs themselves the steep, rocky cliffs stand strong against the crashing waves of the Atlantic Ocean. Year in, year out. Timeless. Do stop by every Monday for a new monochrome photo of the week! Alright, lets keep the momentum going in Week 2 of Monochrome Mondays! I took this photo this summer in Kilcar, County Donegal Ireland. The local spot known as Muckross Head is one of my favorite places anywhere, a combination of unique cliffs pockmarked by centuries of ocean waves crashing together with a stunning vista of Donegal Bay. If you are interested in contributing a photograph to Monochrome Mondays, let me know in the comments below. I plan on featuring one guest photo every month. Last week I returned from a short trip to Ireland. The main reason for being there was for my great aunt Brid’s 100th Birthday Celebration. It was wonderful to be with my (large) extended family for such a special event, and it was also wonderful to be back in Ireland again. It had been eight years since my last trip, which was for our honeymoon. Even though I was there for only a few days after flying in, I made sure to make the most of it. That is something you just seem to do when you visit Ireland. Especially in Donegal where my family is all originally from. It is a place of wondrous beauty- all rugged coastlines and rolling hills, flowing streams and deep glens. Its hard to see it all, especially on such a short trip, but I made an effort to try. Of course I took my camera with me nearly everywhere I went. Below in the gallery are some highlights of the trip. At this point I have written a few posts based around Ireland or the other Celtic countries (here and here). Like my other posts they were based around the idea of finding a musical pairing or match for the photographs I took so I do not want to repeat what I have already written about. On this trip, in between various family events, as I wandered around, I became aware more than ever before about the sounds of Ireland, or Irish ‘noise’ if you will. When I thought about new ways I could write about the country I thought that this idea was interesting. It starts innocently enough when stepping outside in the morning-the chirp of a bird, the incessant baa of sheep which are…everywhere, or the deep rumbling echo of a cow in the distance. As I write this in the last week of January 2014, the New York area, and indeed much of the United States is in a deep Arctic freeze, with snow and bitterly cold temperatures and winds that cut right through even the warmest clothing. That makes people long for some warmer weather, green grass and for the trees and flowers to bloom. Which brings to mind the traditional Irish song quoted above, Tiocfaidh An Samhradh, Summer Will Come, which certainly does the job transporting you to a warmer place in your mind on a bitterly cold day. The origins of the song are from one of my favorite places on earth, and it is a place to which I have strong family ties to. .
County Donegal in Ireland holds a very special place in my heart. My mom was born and raised in Donegal and once encountered; the landscape and the people stay with you. I have been to Ireland several times, but truth be told, other than some day trips outside Dublin, the only place I have really spent time in and become familiar with in Ireland is Donegal, especially the area near Cill Charthaigh, better known as Kilcar, where my mom grew up. Some day I want to explore more of Ireland but having so much family around in Donegal, there never seemed to be much of a point in doing so. Being there never feels like a burden, but rather a treat. It is often described as wild and timeless, the presence of the Atlantic Ocean never far amidst the sparse landscape and rugged hills. Though the usual modern intrusions are there now, it still feels unique and ancient somehow. The photographs I am using here have been taken on different trips there over the years. 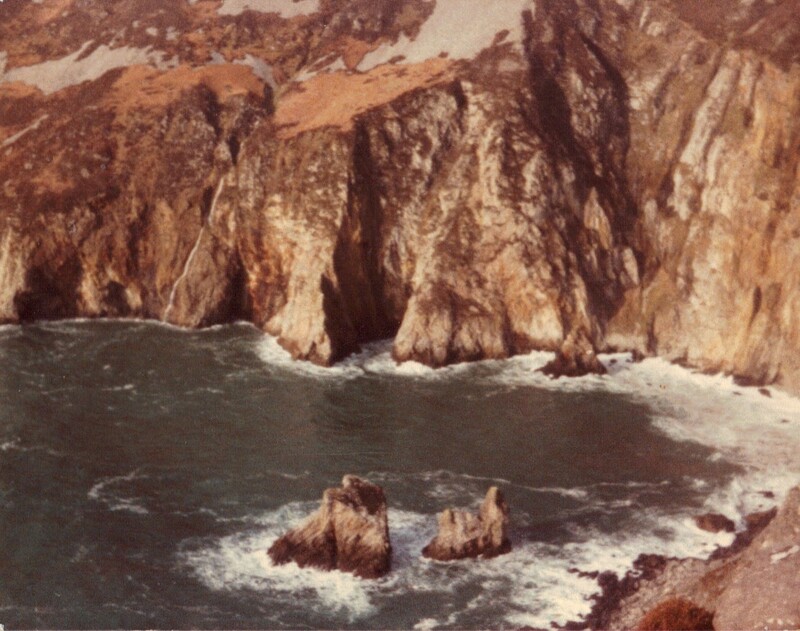 The wonder of Donegal and Ireland in general is that there are so many places where one can take the same photograph they took 30 years ago and have it look unchanged save for changes in photo technology. Another thing that has remained a constant in Donegal over the years is traditional music. 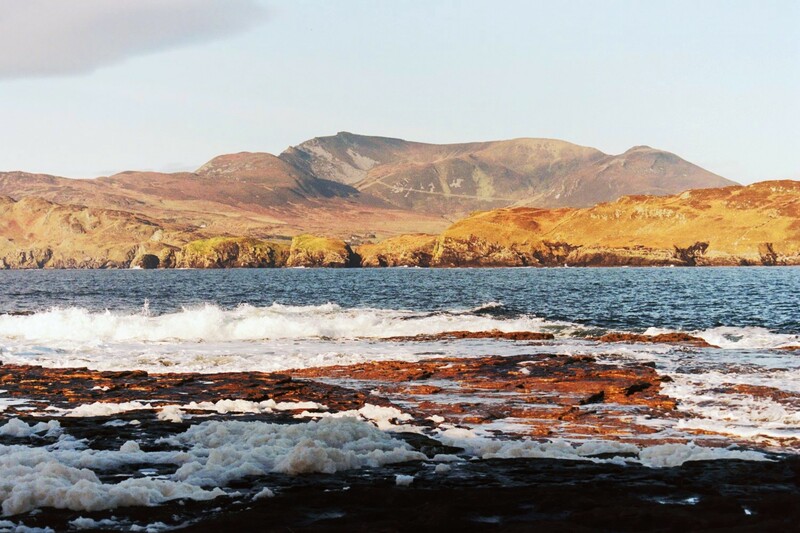 Donegal is one of the areas in Ireland that has a strong Gaeltacht presence (meaning an Irish speaking region). That has helped keep Donegal music firmly grounded and to me for well over 25 years now there has been no better Irish traditional group than Altan, whose roots lie in Donegal. Going over the history of Altan for this edition, I began by looking at their origins, which started with an album by a young couple in 1983, the same year that I went to Ireland for the first time. It was called Ceol Aduaidh by Mairead Ni Mhaonaigh on fiddle and vocals, and Frankie Kennedy on flute. Frankie Kennedy came from Belfast, and Mairead came from Gweedore, further up in Donegal than Kilcar, but also in a Gaeltacht area. A follow up album by the two in 1987 was called Altan, and shortly after, that became the name of the group.